An hour after upgrading to iOS 11, my iPhone 7 Plus phone was at 30%. It was 11am and I had barely used it. An hour later, another update came out – 11.0.1. I updated again, so then it made it until about noon. If you just upgraded your iPhone there’s a really good chance you’re noticing a serious battery drain problem too. According to security research firm Wandera, early updates of iOS 11 took an average of one hour and 36 minutes on average to drain iPhones completely, compared to the iOS 10 update, which took about four hours. I scoured Apple’s help site, and the internet for the fix and only came up with the same old no-real-help advice. Like, “look at what apps are using the most battery,” “enable low power or airplane mode,” and “just wait, it will all get better.” Okay. But now what? So I went back to expert advice from Scotty Loveless, the Apple genius who helped me with iPhone battery problems earlier this year. From earlier tips and tricks he taught me, I was able to reclaim my battery life once and for all. (Or until the next update at least.) Here’s how to do it. #1. Do this battery check right now. Go into Settings > Battery. Scroll all the way down to the bottom and you’ll find two numbers, one for Standby and one for Usage. Jot down your Standby and Usage times and then click the lock button on your phone. Let it sit for about five minutes and then check the numbers again. If your Standby time is five minutes higher, you’re in good shape, but if your Usage time has bumped up by a more than a minute it’s a sign that your phone isn’t resting like it should. When an app is doing things even when you’re not using it, it could be malfunctioning, and stuck in an endless loop that’s draining all your power. That’s what happened to me before, with Exchange Push email keeping the phone from sleeping properly. Email Issues: Let’s start with the potential that you’re having email issues too. Go into Settings > Accounts & Passwords> Fetch New Data. Mine was automatically set to Push. Turn that off, at least temporarily, and set it to Fetch every 15 to 30 minutes instead. You can also use the Manual mode, which only scans for new messages when you actually open the email app. Do that with all of your emails accounts. Now, to more apps, and the ones in the background when you don’t need them. General > Background App Refresh. You can turn this off altogether, or customize which apps you want to keep running by going down the list and toggling them on or off. The other option you have here is to only use background app refresh on Wi-Fi, versus Wi-Fi and Cellular. 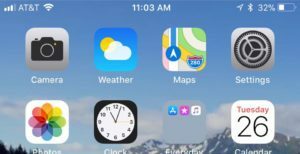 I’ve found that leaving Wi-Fi and Cellular on, while customizing which apps are okay to use it for background app refresh — to be the best fit all the way around. You can also go into Settings > Battery > and switch Low Power Mode on too, but that’s a bit more drastic. When it’s on, all your mail becomes Fetch, and it turns off or down, Hey Siri, background app refresh, automatic downloads, and some visual effects. Another fix for rogue apps is to delete them, then reinstall them and restart your phone. Sometimes, that’s enough to fix a glitch. To find out, just repeat the battery test from #1 again. Letting your apps keep tabs on your whereabouts is another real battery-burner. Location services uses GPS, Bluetooth, cell tower locations and crowd-sourced hot-spots to place your phone on a map. Head to Settings > Privacy > Location Services to customize which apps you want spending that much effort on your location. Again, you can go all-in and just turn the whole thing off. I need Waze, and Workout maps, and a few other features to help me out with location services, but I don’t leave any apps on Always. I go down the list one-by-one and switch to While Using or Never. Most apps set to default Always, so you basically have to set this every single time you download a new app or there’s an update. At the end of all of your apps in Location Services, you’ll see System Services. Check this to see exactly what’s used your location in the last 24 hours. Toggle any of these off that you don’t want using your battery power in the future. A few other quick tweaks here: Powering the display is one of the single biggest drains on your battery. Control Center: Swipe up from the bottom of your phone and use the slider in Control Center to reduce your screen’s brightness. While you’re here, set your screen to Auto-Lock too. Set it to 30 seconds if you can stand it, otherwise, a few minutes should be good, especially since most of Apple’s iPhones now let you use the raise to wake feature. I’m not sure how much battery these two other tweaks make, but when it’s running as low as mine is, it seems every little thing can help. You can turn off listening for “Hey Siri” or customize any of the settings below. Settings > General > Accessibility > Reduce Motion and tap the toggle switch to turn on Reduce Motion. #5. It’s not you, it’s default. I’ve heard people complain that none of their settings changed, so why are they having to go through this again? The fact is, every update, many apps get reset to their own default. It’s not you, it’s default. When you uninstall glitchy apps then add them back, you have to turn off sound notifications and get your phone all spiffed up just the way you like it again. Also, waiting another week for the apps and software to work out all the kinks will help too. It really is a pain, but hopefully this how-to makes it hurt a little less.